Paul Felder, right, in action against Brazil's Francisco "Massaranduba" Trinaldo during UFC Fight Night in Brasilia, Brazil. In case you haven't been paying attention, former UFC champ Eddie Alvarez isn't the only lightweight fighting out of Philly. There's also Paul Felder, the 31-year-old actor-turned-fighter who has a record of 12-3 (4-3 in UFC) and most recently fought Francisco Trinaldo back in September, a third-round TKO loss for the Philly native in Trinaldo's home country of Brazil. And it's Felder who will be next to step back into the octagon, this time much closer to home. UFC announced on Monday night that Felder will face Gilbert "Durinho" Burns on Feb. 11 at the Barclays Center in Brooklyn. 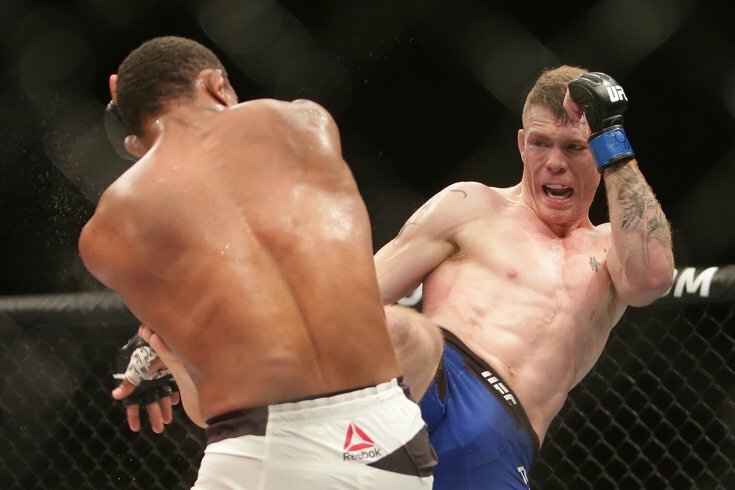 Felder, who has won two of his last three fights, is unbeaten on the East Coast. Burns (11-2), who was also on that UFC Fight Night card with Felder, has lost two of his last three, including a unanimous decision loss to Michel Prazeres in Brazil. With both fighters the recipients of multiple post-fight bonuses (Performance of the Night, Knockout of the Night and Fight of the Night), it's likely to be one of the more interesting matchups of the night. Felder-Burns will be part of UFC 208, which also features Holly Holm and Germaine de Randamie in a five-round women’s featherweight title bout.